The Richard S. Gillis, Jr. Library is located right on the railroad tracks in historic Ashland, Virginia. Also known as the Ashland Branch Library, it joined the Pamunkey Regional Library in 1975. The current home of the Ashland Library opened its doors in 1997, bearing the name of long-time library advocate and Board of Trustees Member, Richard S. Gillis, Jr. Check the Pamunkey Regional Library’s Calendar page for a complete list of Upcoming Events at the Ashland Library. Below are events we think will be of particular interest to Friends of the Ashland Library Members and their families. For more information on any of these events or programs, please call the Library at 804-798-4072. Browse & buy bargain DVDs from a wide selection of movies and TV shows. Selection includes Action/Adventure, Comedy & Rom-Com, Drama, Kid/Family-Friendly Titles, Science Fiction, Thrillers & Mystery, Westerns. Also, Current & Vintage TV shows, documentaries, etc. Some music CDs and recorded books will also be available. Only $1/DVD or $1/disc for multi-disc sets. Cash only. All proceeds benefit the Friends of the Ashland Library. Book Clubs & Recurring Programs: Please call or visit the library for program information. The Morning Book Club – meets every third Friday at 10:00 a.m. The Afternoon Book Club – meets every third Monday at 1:00 p.m. The Evening Book Club – meets every third Thursday at 7:00 p.m. 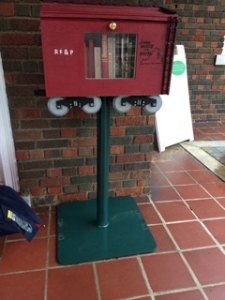 In partnership with local re-purposed creations store, Refunkit, and the Ashland Branch of the Pamunkey Regional Library, the Friends have installed two Little Free Libraries (LFL) in our town. At the Ashland/Hanover Visitors Center, 112 N Railroad Ave., you’ll find a LFL shaped like a freight car. This spot is also Ashland’s Amtrak stop. In Pufferbelly Park on Randolph St. between England St. and Myrtle St., you’ll find a LFL shaped like a house. These LFLs were built by volunteer, Ed Hazelwood. Refunkit has also created their own unique LFL – a repurposed newspaper box with robot head and arms – and installed it outside their shop. The purpose of LFLs is: to promote literacy and the love of reading by building free book exchanges worldwide and to build a sense of community as we share skills, creativity and wisdom across generations. Find out more at the Little Free Library web site. Visitors to Little Free Libraries are encouraged to Take a Book, Return a Book. The Friends will maintain our LFLs, stocking them with good quality books. We hope that the entire community will make our job easy by sharing books with others through the LFLs. 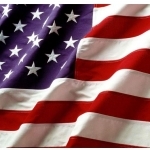 The Friends of the Library biggest annual event is our annual July 4th Book Sale. We hold our book sale at the Ashland Library during Ashland’s 4th of July celebration. Hours are generally 9 am to 2 pm, but check local newspapers and posters to confirm. The sale includes a wide variety of hardback and paperback books, CD’s, DVD’s, Audio Books and VHS videos. All proceeds go to support and to meet needs at the Ashland Library. The Friends of the Library Book Sale has become a traditional part of Ashland’s 4th of July celebration event sponsored by the Hanover Arts & Activities Center. Don’t miss it! The Friends of the Ashland Library maintains a continuous book sale at the Ashland Branch Library. You will find bargain fiction and non-fiction, audio books, and videos in the area around the copy machine and in the entrance hallway of the library. You can donate your gently used, unwanted books, audio books and videos to the Friends at the library circulation desk for the on-going sale. Proceeds from the sale are used to fund some of the library’s programs and sponsor special events. Please donate only clean, gently used books and do not donate encyclopedia sets, Reader’s Digest, or textbooks over 5 years old. (Those items can be taken to the Goodwill store.) See more donation guidelines below in Got (too many) Books? Read about our huge annual July 4th book sale. How about DONATING them to the Friends of the Ashland Library for our ongoing book sale? Guidelines: We much prefer books from 2010 or later, unless they are timeless classics. No textbooks or encyclopedias. Please make sure your books are clean and in good condition. We cannot accept books that are dusty/dirty, musty/moldy, have water damage, torn pages, heavy highlighting , broken spines or smell of cigarette smoke. These won’t sell. Please recycle or discard them. Older books (pre-2010) in good condition can be donated to Goodwill or put in our Little Free Libraries (space permitting). THANK YOU for helping the Ashland Library! There are many ways you can support the Friends of the Library, and in turn, Support the wonderful services and resources of the Richard S. Gillis, Jr. Library. Please use our Contact Us form if you are interested in participating or have a suggestion. See our Membership page for information about joining the Friends of the Library.